The Indy 500 made its racing debut in 1911 and has long since been a major point of pride and anticipation for Indianapolis and racing fans around the country. As the world’s greatest single day sporting event, the Indy 500 draws a huge crowd of visitors to Indianapolis each and every Memorial Day weekend. The race has done a lot for the city in shaping its identity and creating a tight community. This month, we honor everything that the Indy 500 has meant to us. The Indianapolis Motor Speedway was first built in 1909 as a gravel-and-tar track, and it originally hosted a series of smaller racing events. The track underwent some renovations during its first few years as it rapidly began to acquire fame and recognition. On May 30th, 1911, forty drivers raced against each other in the first ever Indianapolis 500-Mile Race. At the time, who could have known what major impact this race would have on our city? Over the last century, the Speedway has become an iconic landmark of our state and its capital. The Motor Speedway has shaped the identity of Indianapolis for over a century. The speedway itself is located in a section of town literally called Speedway. Over the course of the years, sports enthusiasts have come to love the home of the Indy 500 and everything it has to offer. Recently, the city has undergone a number of renovations and development projects, giving it an attractive appeal to visitors from all over. Now, visitors can’t walk through the city without seeing some mention of the race—or the 500 Festival buildings— at any given time of the year. Like most sporting events, the Indy 500 brings people together. It’s amazing to see how much this city does each and every year during the month of May to get ready for the race. With parades and events going on all throughout the month—dedicated to the race—Indy residents pull together to really kick off every single summer. In preparation for the big day, it seems that everyone within the local Indianapolis area share some common ground. There truly is no better way for the city to unite and cooperate than during the preparations of the Indy 500 every single year. The Indy 500 means a lot to this city, and we honor it this month for all that it has helped us achieve. What has the Indy 500 meant for you? Share your stories in the section below! 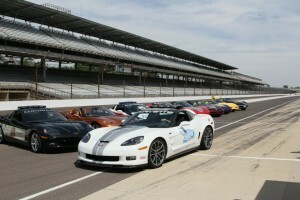 Posted in Corvette, Indiana, Indianapolis, Racing and tagged Automotive, Indianapolis Motor Speedway, Love, Racing.